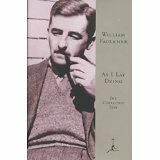 As I Lay Dying is Faulkner’s fifth novel published in 1930. Most of the 59 chapters are short and are narrated by 15 different characters in a stream of consciousness writing technique. He wrote it in six weeks and didn’t change a word of it. It’s considered one of the best novels of 20th-century literature. Addie, the mother in a poor family, requested that when she dies, she wants to be buried in her hometown of Jefferson, Mississippi, a trek in a wagon pulled by mules. Her husband and five adult children try to honor her wishes but run into several difficulties. Previously I was not a fan of Faulkner’s style, but after reading Intruder in the Dust, I was hooked. I couldn’t stop reading As I Lay Dying although I had many projects to do, I had to find out what would happen next. In the chapter from Addie’s point of view in a flashback, she says her father used to say that “the reason for living was to get ready to stay dead a long time.” Readers learn about her unhappiness with her life. She’s tired of taking care of the family. She regrets choosing Anse for her husband. Faulkner created a memorable family. I recommend taking time to meet them. Definitely a good read and your commentary brought a lot back to me (I read it in 1963). I may have to read it again. I told my roommate at the time (USAF) what a great read it was and encouraged him to read it. He couldn’t get past the first chapter, complaining that he couldn’t understand it. Faulkner’s style isn’t easy but the story is worth the effort. Glad you liked it too. I’ve been carrying around a whole stack of vintage Faulkner books for years, saying someday I must/want to sit down and explore this genius mind. Maybe I should make that someday now, while I still can. Thanks for the nudge, Juliana. Once you get used to his writing style, the books are a fast read. Try one, you might like it.